It's time for the September edition of the 12 Kits of Occasions! 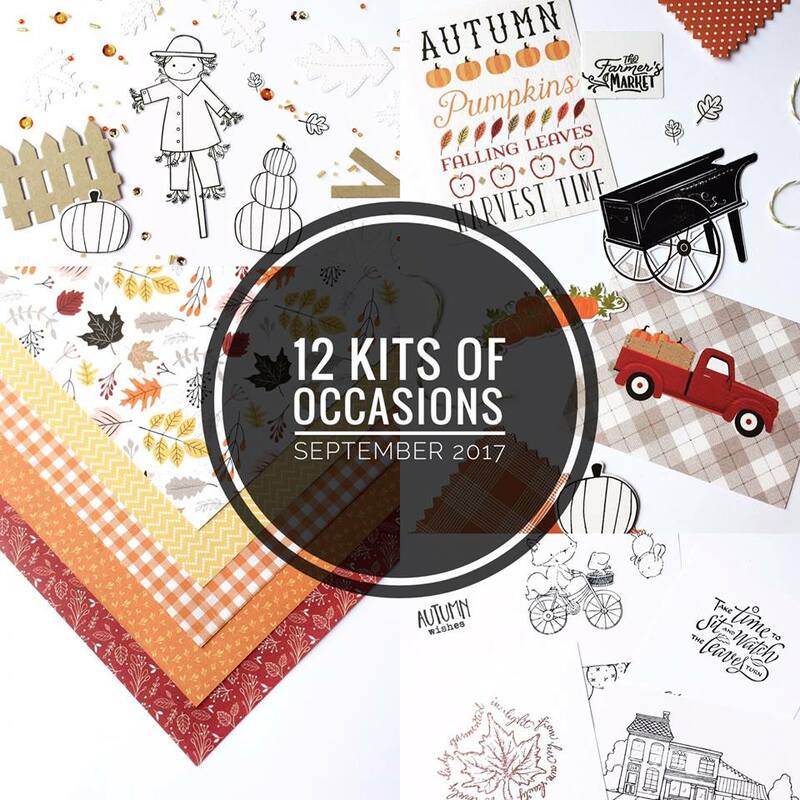 Head over to the 12 Kits blog to see what the rest of the team has done with this fabulous fall inspired kit! 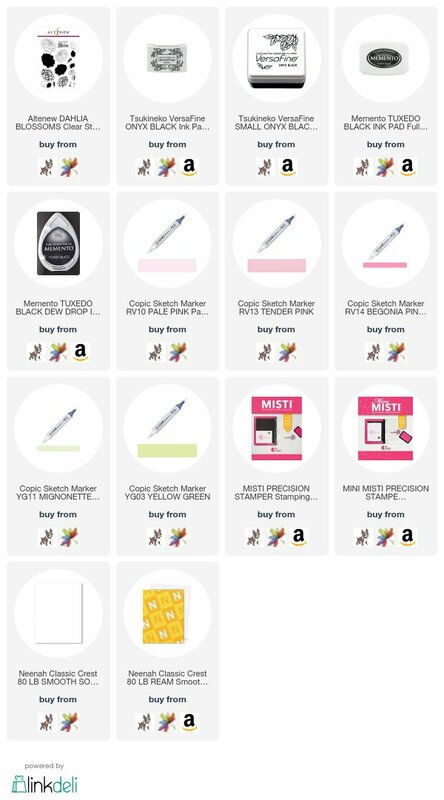 I am submitting my cards to the Simon Says Stamp Wednesday Challenge Anything Goes this week! 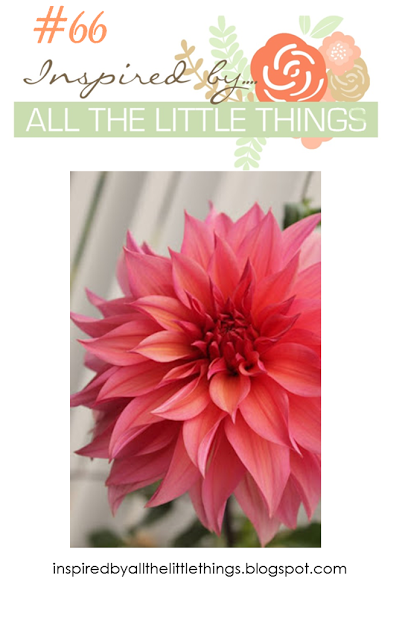 I chose the Altenew Dahlia Blooms stamp set for my card. Masking and stamping both the large and small flowers and then Copic coloured. I cut the panel with a stitched rectangle and adhered it to a top folding grey card base with foam tape. Head over to the Inspired By blog to see who I invited to be my guest this week. 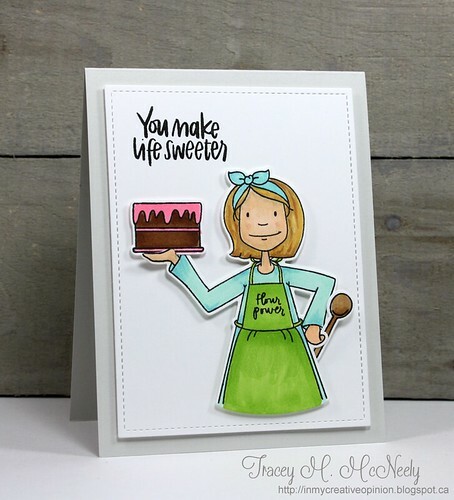 You will love her gorgeous card and see what the rest of the team has made for this week's challenge as well! 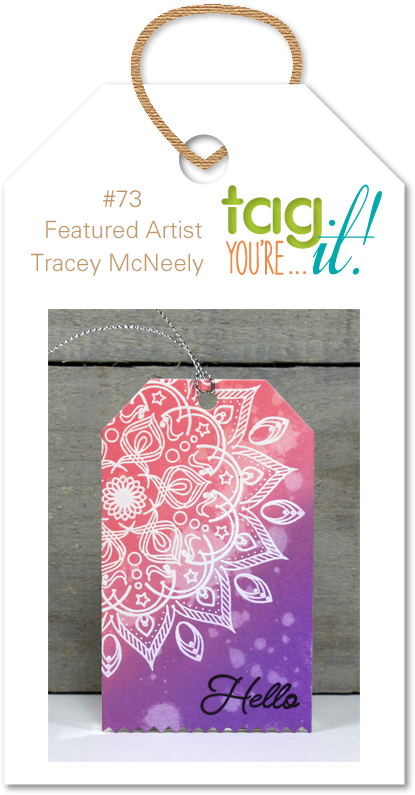 There is still time to play along with us over at Tag You're It for challenge #73! 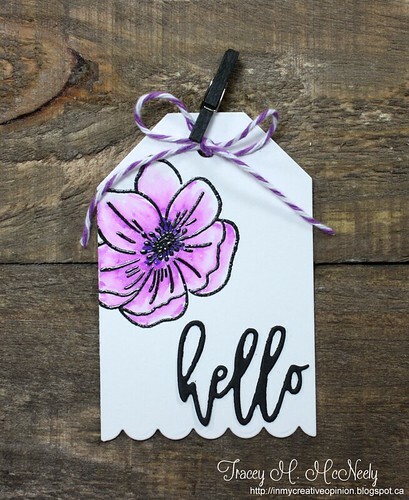 This week for the reminder I am CASEing my own design with this tag using the Anemone stamp set from Right at Home along with the Script Greeting dies. If you haven't already I hope you get a chance to play along with us! After an abrupt stop to a cold and wet summer a few weeks ago, it has actually found us this week and we have had hot and sunny days. So with a great forecast for the second weekend in a row I can hardly wait. Have a great weekend! 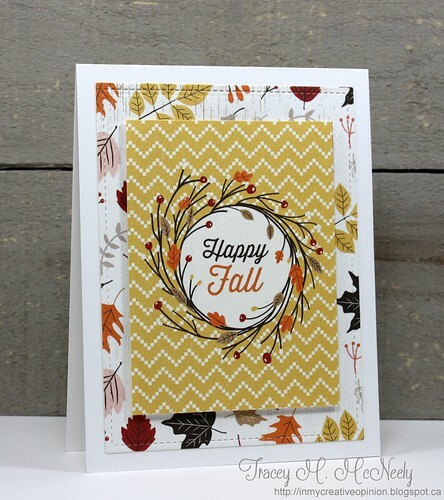 The September Essentials By Ellen Mix It Up Challenge is mixing with Honey Bee Stamps! I started by sponging Distress Oxide inks in Wild Honey and Spiced Marmalade on to a white Bristol Smooth panel. I flicked some water on the panel and used paper towel to absorb the excess. 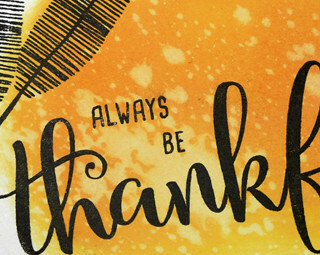 Then I stamped the sentiment from the Thanks and Giving set by Honey Bee Stamps. 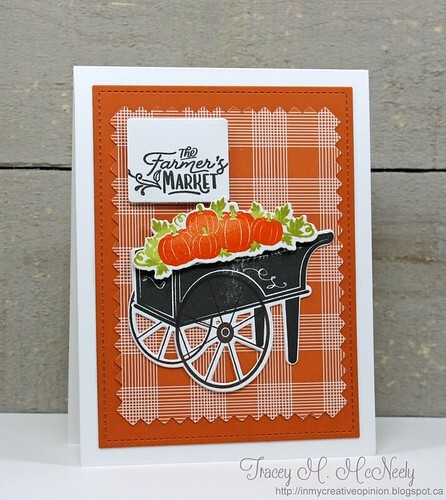 The final touch was to stamp two of the leaves from the Essentials By Ellen Rustic Botanicals. 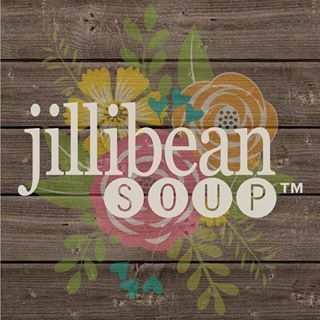 I have a project up on the Jillibean Soup Bean Talk Blog today featuring the new Farmhouse Stew products and new alpha stickers. 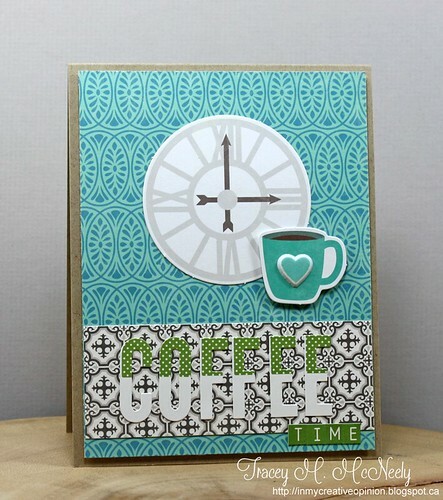 Also a second project for the Fall Coffee Lovers Blog Hop. These papers have a very warm and rustic feel to me as we get into the season of comfort food and a warm cup of coffee in the afternoon. The newest in the Leading Lady line at Ellen Hutson LLC is Baker Lady. 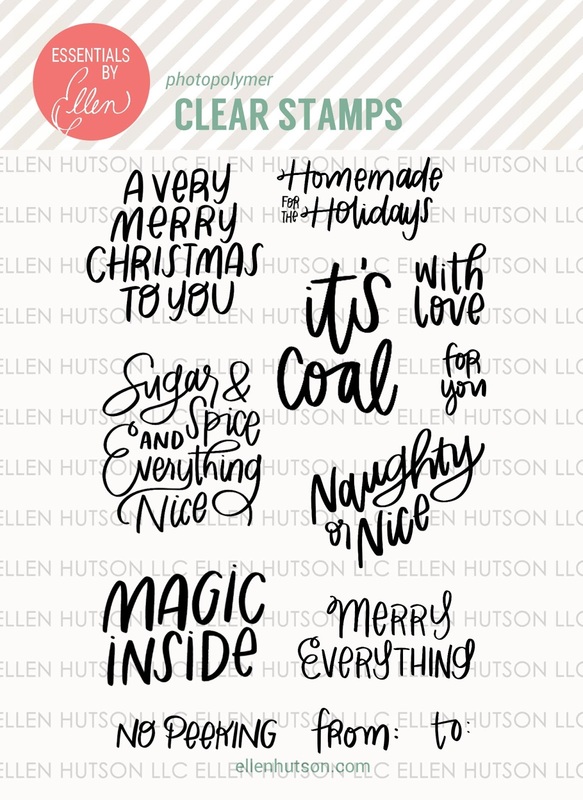 She is just in time for all your holiday gift making and cards. 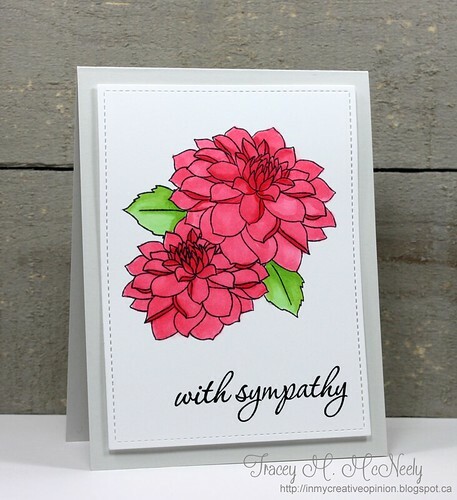 I am still a learning about Copic colouring so I Love it when Kathy Racoosin does the 30 Day Coloring Challenge because it pushes me to work on my skills a little each day. I am super excited because this coming weekend I am meeting up with my friends Ardyth Percy-Robb and Natasha Kara and we are go to meet and colour for the day with Kathy Racoosin on The Coloring Challenge Roadtrip! 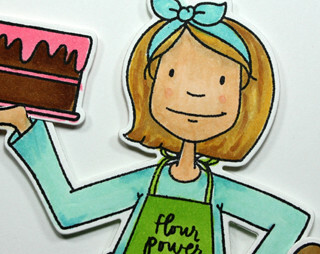 I watched Sandy Allnock's video colouring Baker Lady last week during one of the blog hop's in The Classroom at Ellen Hutson. I paid very close attention to how she coloured her skin and tried to transfer her instructions for colouring hair to make my lady's hair blonde. I have lots of work to do in that department-lol! When it came to colouring the cake I used exactly the same colours as Sandy. Thanks for the great tips Sandy! This is my colouring for Day 17. 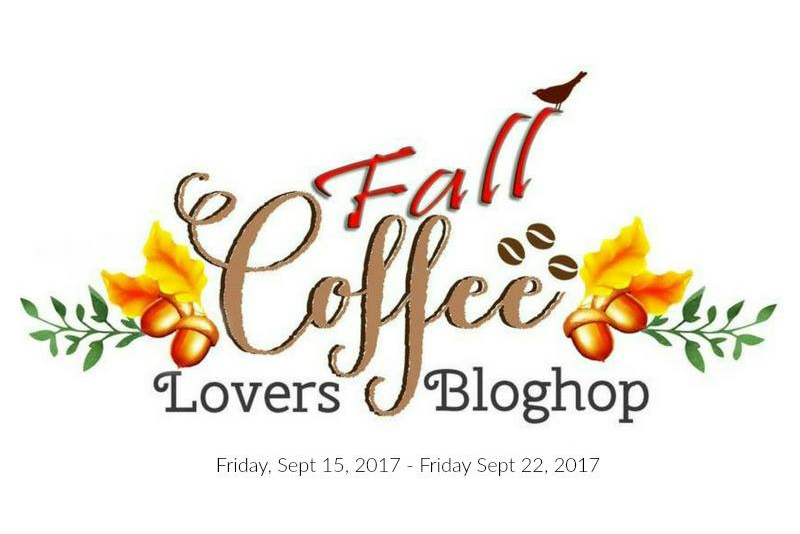 Happy Friday, today is the first day of the Fall Coffee Lover's Blog hop over on the Coffee Loving Cardmaker's blog. 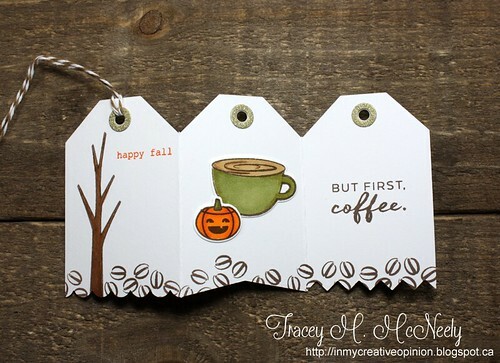 I am using the brand new Essentials by Ellen Concertina designer die for my fall coffee themed tag! 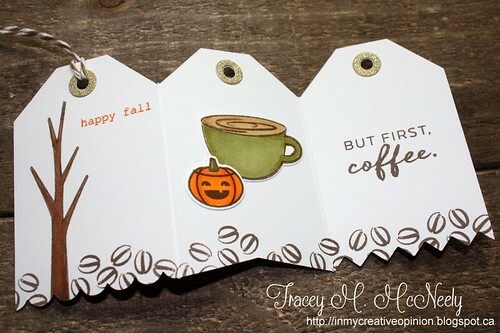 So how about a pumpkin spice latte, after all it is pumpkin spice season! Big Sale at Ellen Hutson LLC this weekend! 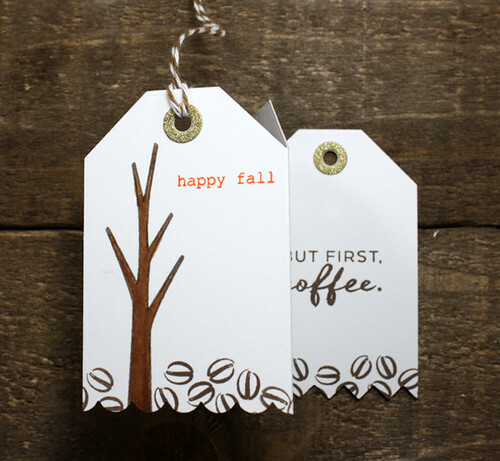 Celebrate September by picking up some fresh new stamps at 20% off!!! 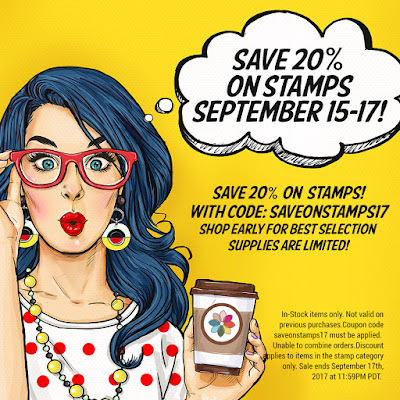 Friday through Sunday, use the code saveonstamps17 to take 20% off all stamps in the stamp category. 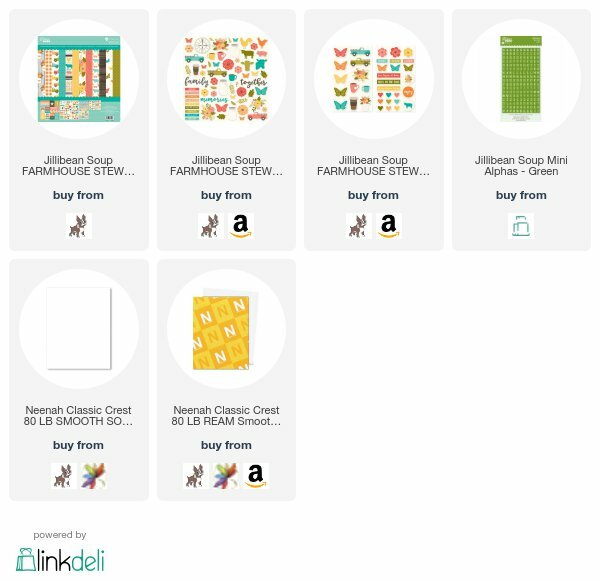 Coupon codes cannot be combined and are valid on in-stock items only. 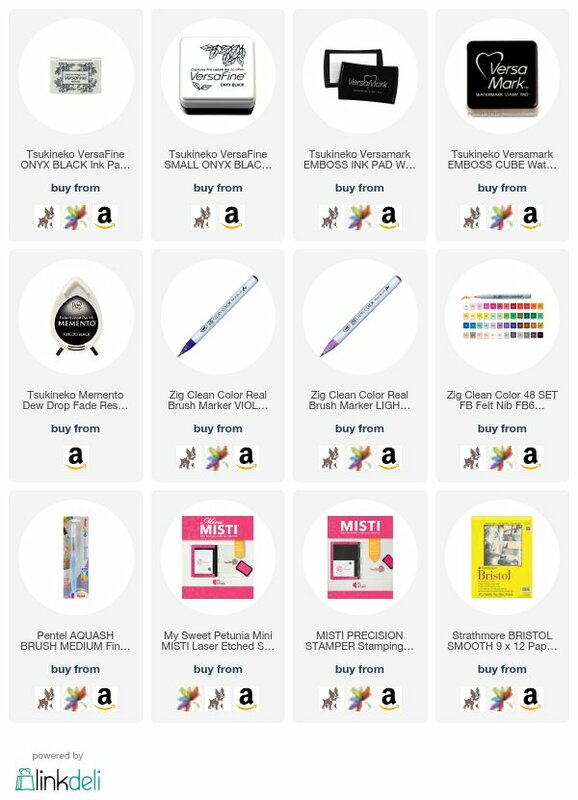 Not good on previous purchases. Sale ends September 17th, 2017 at 11:59PM PDT. Please note, we anticipate that the number of orders will alter our quick shipping time so please expect that your order may take up to a week to ship. And please understand that we will not be able to combine orders. Thanks & have fun shopping! 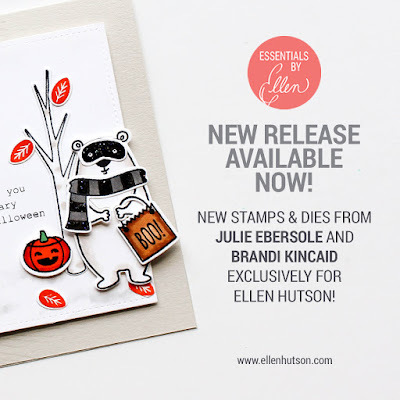 I am so excited to be posting today as a Guest Designer for the September Essentials By Ellen release! You are going to love all the stamps and designer dies that are a part of this new release! I am hopping along today with Ellen Hutson LLC in The Classroom! 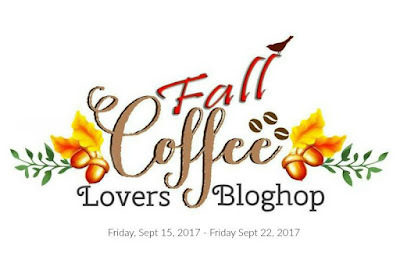 If you are hopping you should have arrived here from Carolynn Peeler's blog. 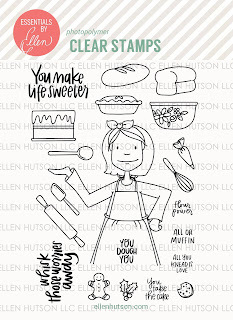 I am showcasing the new Essentials by Ellen No Peeking sentiment stamp set that was designed by amazing Brandi Kincaid. 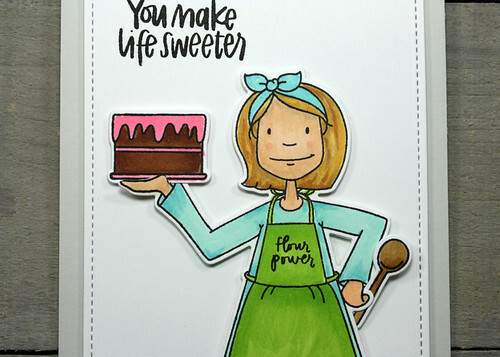 My first card uses this set combined with the newest in the Leading Ladies series, Baker Lady, also designed by Brandi Kincaid. I began by sponging a background on a Neenah solar white panel using Ranger Distress Oxide ink in Worn Lipstick. I spritzed some water in the palm of my hand and flicked it on to my card and then absorbed the excess water with a paper towel to remove some of the ink and let the oxides work their magic. 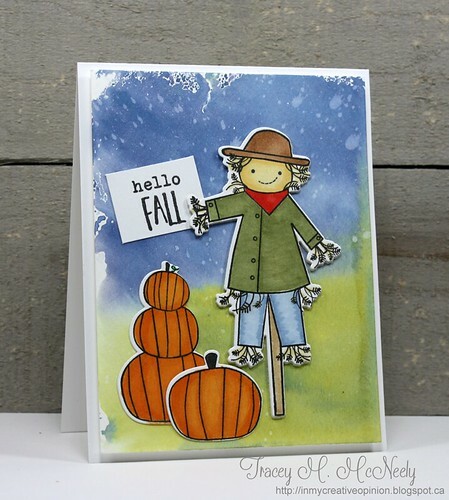 I stamped the sentiment from No Peeking over the dried panel using VersaFine Onyx Black ink. 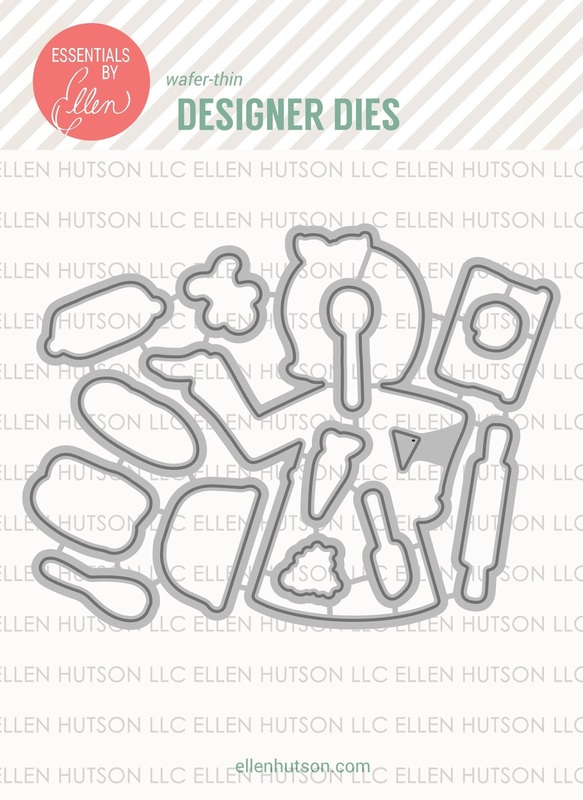 Next I stamped the rolling pin and gingerbread from the Baker Lady Clear Stamp set, Copic coloured them and then die cut them from the Baker Lady Designer Dies. I adhered them to the card using some foam tape for dimension. The last step was to add a few sparkling clear sequins that I filled with some Silver Stickles. Makes for a cute Christmas card. The panel was adhered to the card base with foam tape for dimension. 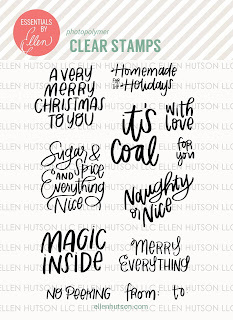 My second card uses another sentiment from the No Peeking stamp set along with the new Modern Christmas Clear Stamps deigned by awesome Julie Ebersol. 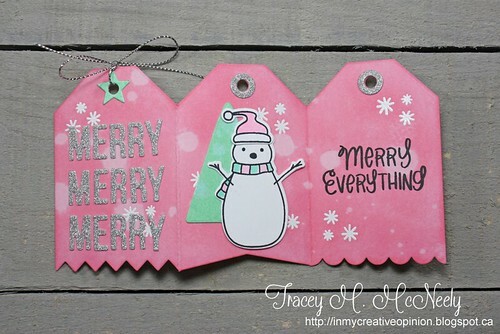 The holly is this set is so fun because the leaves can be stamped either as solid image or a sketch image. I arranged it so that the sentiment was lower than the holly and so that together they were centred on the panel. 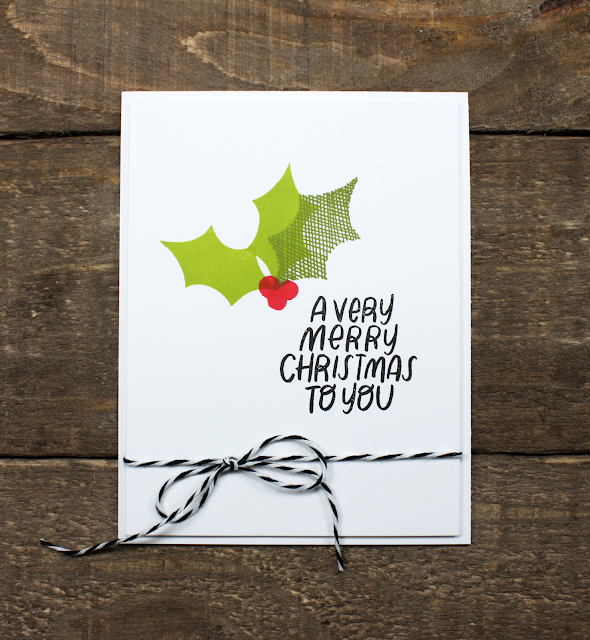 The sentiment was stamped first in VersaFine Onyx Black and then I stamped the holly using both the solid and the sketch leaves. I finished it off by tying some black and white twine around the panel and adhered it to the card base with foam tape for dimension. 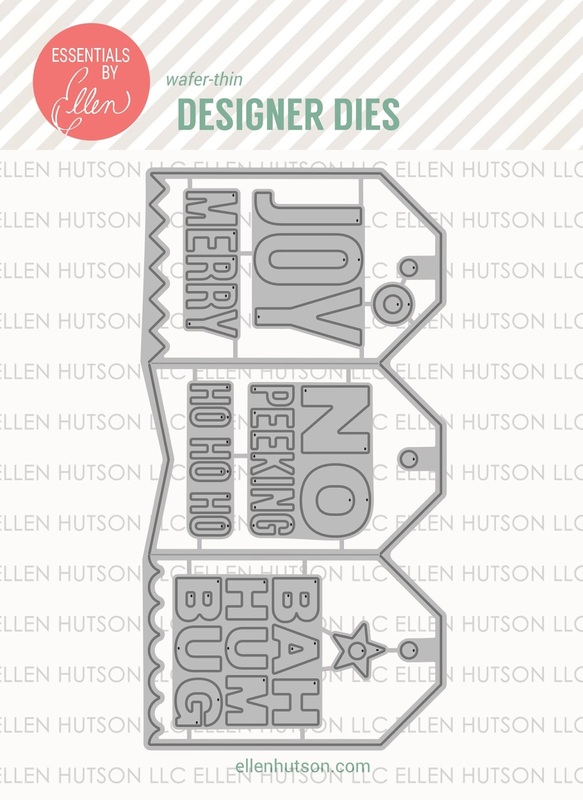 One last project using the new Concertina Tag designer die along with the No Peeking and Bear Ware 2 stamp sets. 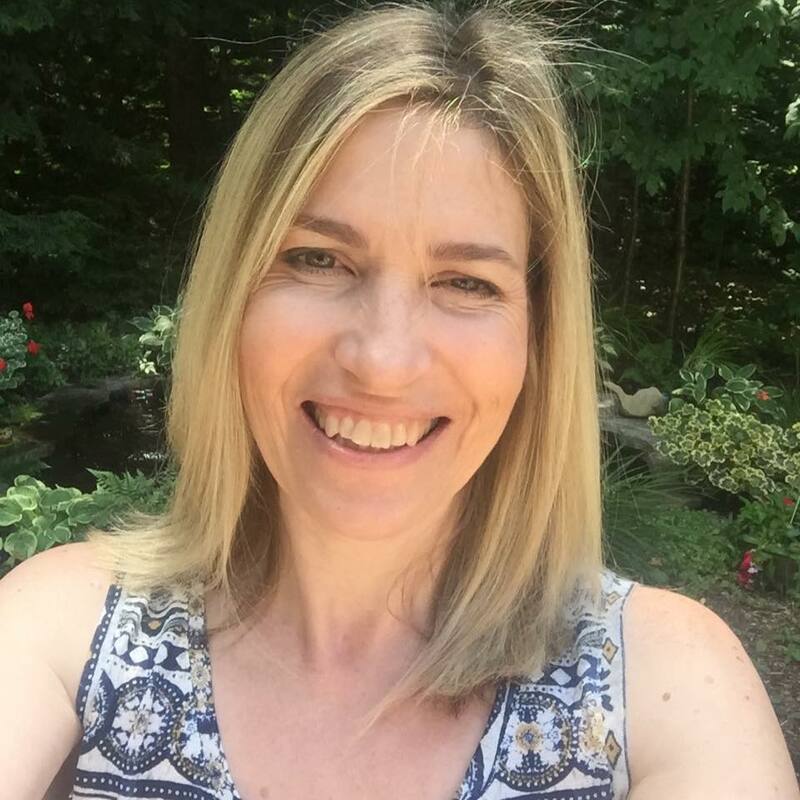 Next on the blog hop list is the fabulous Lisa Adametz! Back again today with a couple more cards using the September Essentials by Ellen release! The new Bear Ware 2 designed by Julie Ebersole is such a fun set. I fell in love with that bear from All Inside when it was released last year, and then after that the Bear Ware was introduced and what a fun concept to be able to play paper dolls once again. I spent hours as a child playing with my paper dolls. 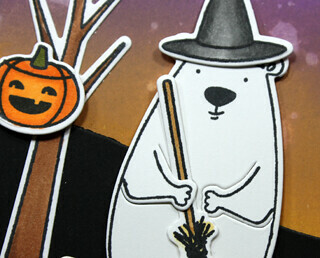 Today I have two cards to share with you, one for Halloween and one for Christmas! For this first card I created a Distress Oxide ink Halloween background and I slicked some water on it and absorbed the excess with paper towel. These days my recycle bin seems to be full of paper towel covered with colourful spots--lol! 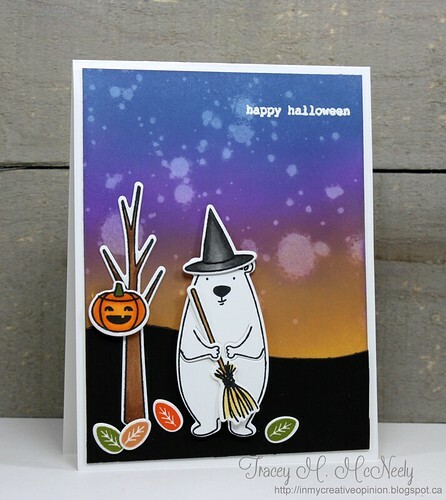 I white embossed the sentiment on the background and then I stamped, coloured and die cut a bunch of images from Bear Ware and dressed the bear up in a witches costume. The bear and the hat were adhered to the card with foam tape. 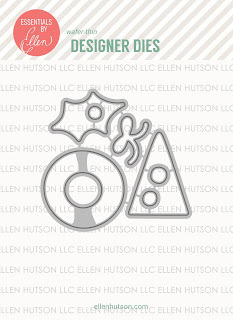 The second card I went closer to my CAS white space loving heart and I stamped on embossed white snowflakes on a light aqua circle that I adhered to the card base with foam tape. 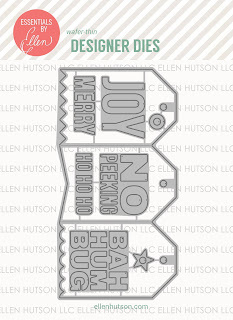 I stamped, coloured and die cut a few more images from Bear Wear to go along with the bear. Some warm clothes and a snowbuddy, these images were also adhered with foam tape. 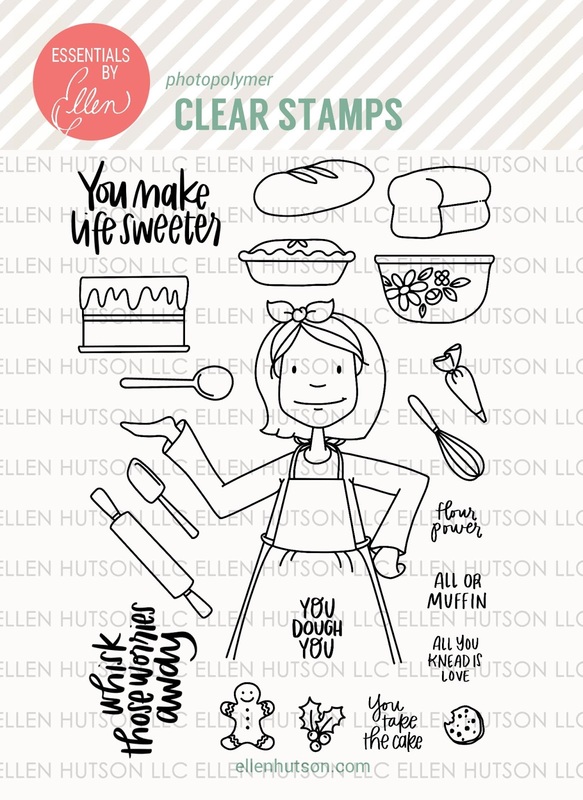 All of these stamps are available now. 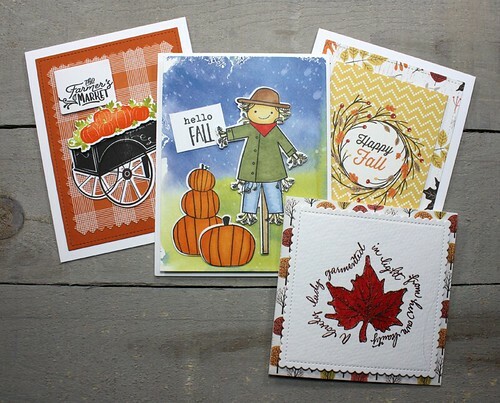 I have listed links to the entire September Release below and other products I used to make my cards today.